Monte Carlo experiments are used to study the unbiasedness of several common random utility models for a proposed adaptive stated preference survey. 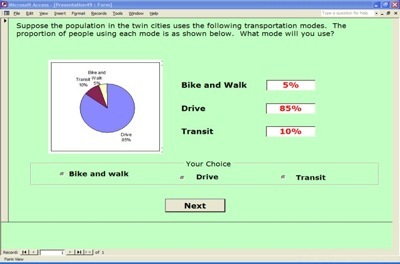 This survey is used to study the influence of the knowledge of existing mode shares on travelers mode choice. Furthermore, the survey is applied to a sample of subjects selected from the University of Minnesota. The results indicate that the presence of mode shares in the mode choice model does influence the decision of travelers. The estimates are found to be biased by the Monte Carlo experiments.